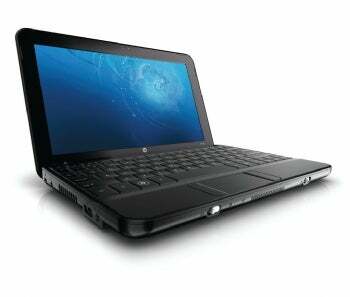 What do you do when you already have a couple of well-received netbooks? You make another one, of course. 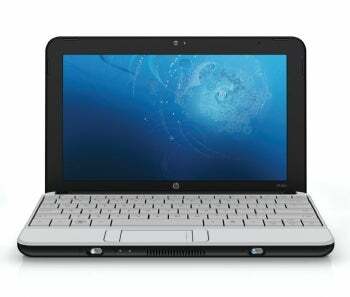 And sure as Shadrach, HP is following up on the success of its consumer-friendly Mini 1000 and business-centric Mini 2140 netbooks (not to mention its designer-minded Mini 1000 Vivienne Tam) with the HP Mini 110. We received a unit shortly before the news broke, so we can't offer you a full review yet, but here's a quick take following an afternoon of playing around with HP's newest netbook. The big difference between the new model and its predecessors is a couple hundred bucks. Available on June 10, the Mini 100 XP (available in "Black Swirl") will sell for $329, while the 110 Mi edition (Linux-based) starts at $279. Compare those prices with the $549 tag on the Mini 1000 that we reviewed seven months ago. What do you gain and what do you lose with this more affordable model? Well, HP swaps out the multimedia dongle port in favor of a built-in VGA port (plus a built-in RJ-45 ethernet jack for good measure). The sweet-looking speaker grille planted inside the 1000's hinge is absent from the 110, replaced by a horrid-sounding speaker mounted beneath the display. That display offers a 10.1-inch-diagonal image with a native resolution of 1024 by 576, and the slick edge-to-edge plastic cover has has vanished in favor of a big plastic bezel that makes the Mini 110 look like the love child of the Mini 1000 and the Acer Aspire One. Upgrade options exist, naturally: 802.11b/g not enough, and you want wireless WAN? Done. 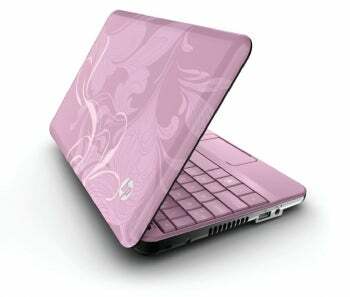 Demand this netbook in "White Swirl" or "Pink Chic"? As of July 8, those colors will be available. Feeling cramped? You can slot in a 250GB hard drive and boost the RAM to 2GB. I also appreciate the Mini 110's software selection, which is slightly more robust than the usual feeble bloatware. For instance, Syncables allows you to sync five PCs on a network. We'll have more to report on the software bundle when our full review of the Mini 110 goes live. Otherwise, this looks like a slightly thicker, economy-class version of last year's model. The 110 measures 10.3 by 6.6 by 1.2 inches and weighs 2.33 pounds, compared to the Mini 1000's 10.3 by 6.6 by 0.99 inches and 2.25 pounds. And that isn't a bad trade-off for the extras inside the machine--and the lower price. We have to wait and see how it does on our WorldBench 6 test suite, but it's almost certain to perform on a par with the Mini 1000, which earned a 30 (slightly below the current netbook average of 36). Check back later for a complete review.